Sentenced to 27 days, Elisabeth Epps will work to bond out minor offenders from jail - Denverite, the Denver site! The cash bail reformer was sentenced to 27 days with work leave, meaning she can handle cases of people she meets in jail while she’s out during the day Monday through Friday. Jan. 24, 2019, 5:30 a.m.
On Tuesday, cash bail reformer and self-described abolitionist Elisabeth Epps had a hair appointment. Philomena Hukporti, her braider, texted ahead to see if she’d still make it despite snow and icy roads. Epps was not going to miss it. On Wednesday, she was possibly heading to jail for 90 days, and she wanted to be ready. In 2015, Epps was at a pool party when she intervened with police dealing with a young man in crisis. She was arrested and eventually convicted of obstructing a peace officer. But Epps’ proceedings dragged out through appeals processes. As she waited for her final day in court, Epps’ profile in the metro area skyrocketed. She began advocating to remove cash bail for low-level offenses, first with a Mother’s Day bailout fundraiser that raised $20,000. Soon, that effort turned into a full-fledged campaign to reform state laws and raise money to bond out more people. Week after week, Epps made trips to area jails where she posted bond for strangers. Her fund now has about $70,000 to work with, which often cycles back to her account once people appear in court. Epps is also working with state lawmakers and the ACLU to pass legislation to end cash bail for low-level offenders. As an activist who knows all too well that inmates die while being handled by law enforcement in incarceration, Epps has worried that even one day behind bars can be dangerous. She feared for the lives of people who could not pay bail as low as $10, and now she feared for her own safety. So Epps went to get her hair braided for the first time in years, an act of self-care that she felt would prepare her for “maximum security shampoo” and protect her self-esteem. She’d prepared to pass her bailout efforts to four volunteers who could keep the work going if she was taken into custody. Her phone rang endlessly with messages of support from friends and supporters. But, on the day of her sentencing, Epps was granted a small allowance in addition to jail time. On Wednesday morning, Judge Shawn Day sentenced Epps to 27 days in jail with work leave. It means she can exit during the day, Monday to Friday, to continue her bailout work and potentially free people she meets while she spends her nights and weekends in a cell. Supporters filled two courtrooms as Epps was sentenced. At 8 a.m., Epps entered the room in Aurora’s municipal court wearing a black suit and pink tutu. “Serena lost last night,” she said to supporters who came to watch, who laughed and cheered as she made her way to the defendant’s chair. “Thank you,” she whispered to them, crying. More than 30 people had crammed themselves into two rows behind her, sitting on laps and sideways into the aisle. Just as many who could not find a place to sit filled another courtroom next door where a video feed was set up, the sound coming in and out as Epps’ public defender and the prosecution began to make their cases. When it was time for Day to make his decision, the judge made it clear that he was not going easy. He began by quoting George Washington. That “concept of judicial independence” has been “under attack,” he said, from “the highest office of this country” to this very room. In dragging out her sentencing, Day continued, Epps demonstrated a lack of respect for the law. Epps shook her head and cried. Yes, Day said, she admitted guilt just once, in a motion filed this week to lower her sentence from 90 days in jail to house arrest. “This case deserves consequence,” Day said. But as he concluded, his tone softened. With the paperwork asking for a lighter sentence, public defender Sandra Freeman also included 48 letters from supporters, of which Day said he read every word. Thus, the court would offer her two alternative sentences: 27 days with work leave or 27 days served out on weekends. “Thank you,” Epps said as she embraced Freeman, her face wet with tears. Then, a bailiff led her into custody. On her way out, Freeman addressed a few reporters hanging back for questions. And, she added, Day granted her the right to work with people she’ll meet while she’s there. Day, it should be noted, has been recognized for his own action to reform bail in his courtroom. When her sentencing was complete, Epps supporters gathered outside the courthouse. 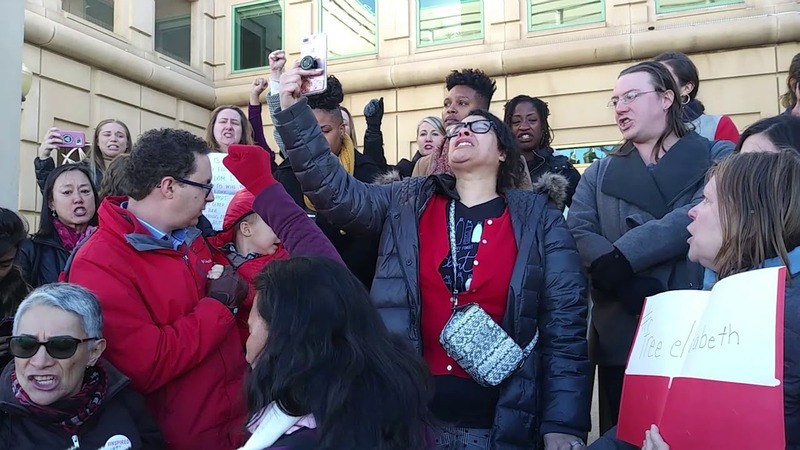 Before she knew her fate, Epps connected her struggle with many of the social justice causes Denver activists are championing. On Monday, as Freeman was preparing to submit the letters and motion to the court, Epps marched in the annual Martin Luther King Jr. Day Marade, and then spoke as the keynote at Civic Center Park. She began with King’s legacy, what she called his “whitewashed, revised history.” At the end of his life, Dr. King, the radical freedom fighter, embarked on a “poor people’s campaign,” which was as much action as it was concept. One of those actions was Resurrection City, a shanty town that occupied 15 acres on Washington, D.C.’s National Mall. While she didn’t say it outright — Epps promised Marade organizers she would not name names — she was referencing Denver’s “urban camping ban,” which advocates for the city’s homeless are now attempting to overturn in a city ballot measure this spring. She celebrated the city and state’s successes: slavery’s abolishment in Colorado’s constitution, the end to conversion therapy in Denver, and the end of low-level bail and booking fees in local jails. The crowd cheered as she spoke, then grew silent as she came to her situation. Then, the tablet she was using to read her speech went dark and she went off script.